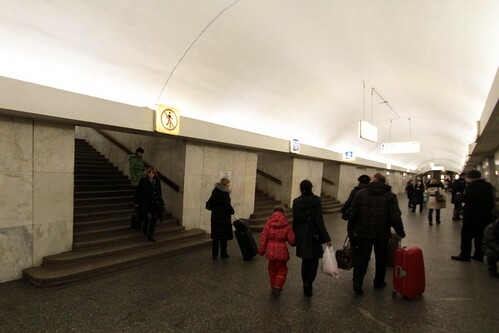 Interchange stations on Soviet designed metro systems are a little odd for anyone accustomed to urban rail networks elsewhere in the world – the platforms for each line are treated as their own station, with their own street entrance, and their own name! 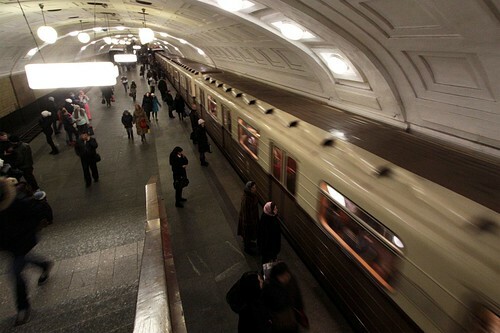 On the Moscow Metro the most complicated station is the four way interchange between lines 1, 3, 4 and 9. 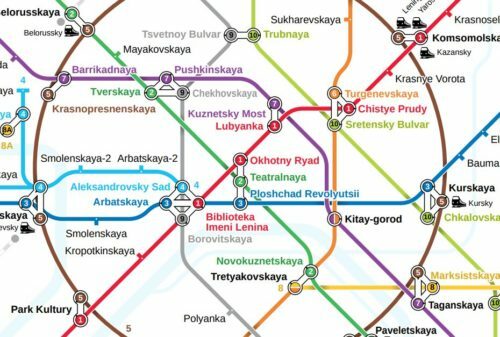 And just to make this station complex even more confusing, there is no direct path between Borovitskaya and Aleksandrovsky Sad – passengers have to travel via one of the two other stations to interchange. But just to confuse matters, some two way interchange stations have a common name on both lines. 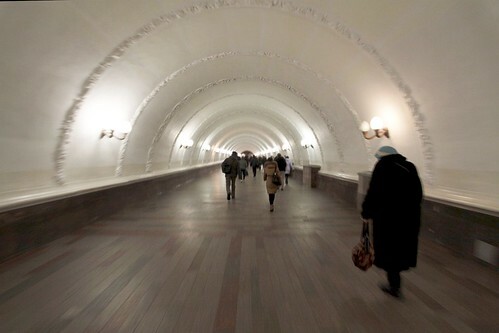 Then there is the station at Kiyevskaya – which serves has three lines but has a single name! 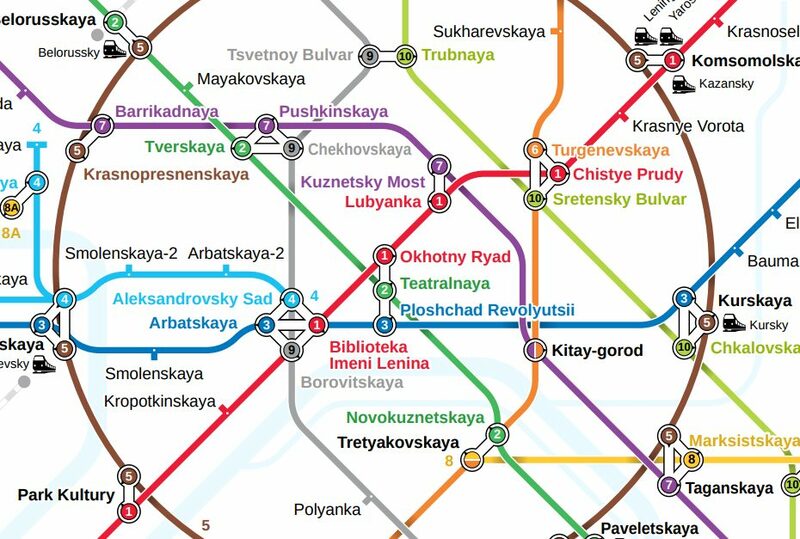 The naming conventions for interchange stations on the Saint Petersburg Metro are far more consistent. 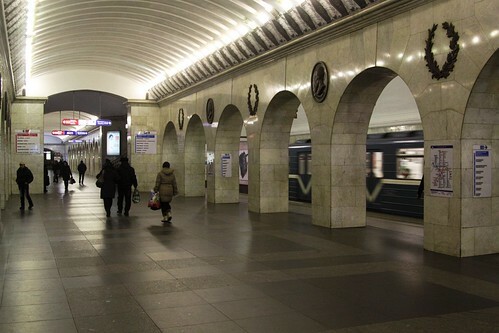 Ploshchad Alexandra Nevskogo – the line 3 platforms are called ‘Ploshchad Alexandra Nevskogo I’ while those on line 4 are called ‘Ploshchad Alexandra Nevskogo II’. 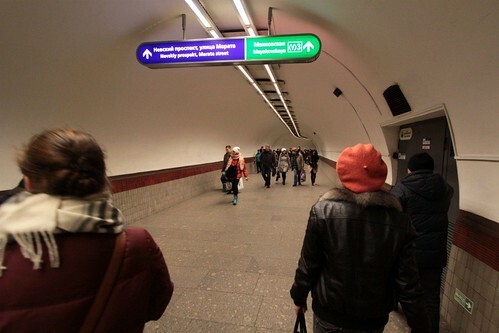 Tekhnologichesky Institut – a cross platform interchange is provided between line 1 and 2. 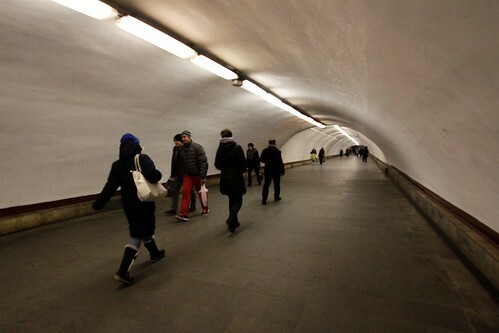 The Kiev Metro is a lot simpler to understand. There are three transfer stations, each serving two lines, with each platform having a separate name. 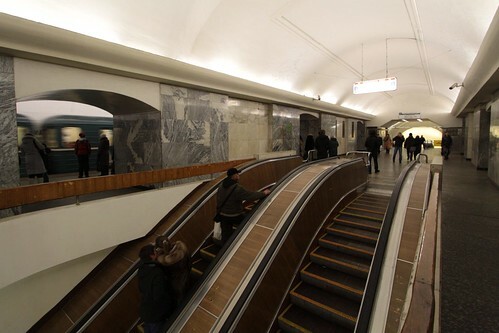 The use of separate names for each line starts to make sense when you look at the standard design of Soviet metro stations – two tracks, an island platform in the middle, and a single escalator incline leading to the surface. While simple, this design was quite limiting if the station needed to be expanded into interchange facility, so instead a second parallel station would be built alongside for the new line, with underground walkways provided so that passengers can move between the two platforms. 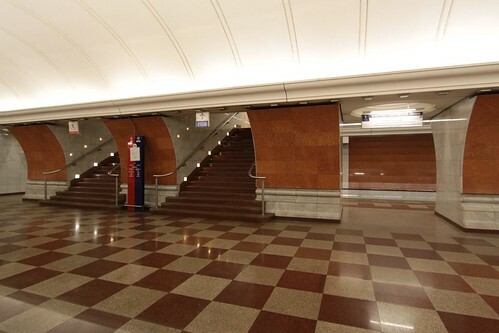 These passageways are usually located one level above the station platforms, linked with stairs passing over the train tracks. The number of staircases between platform and passageway varies. But in all cases, a footbridge is required to carry passengers over the tracks. Another way to link interchange passageways with trains is via a staircase in the middle of the platform. Again, the width of the staircase can vary. 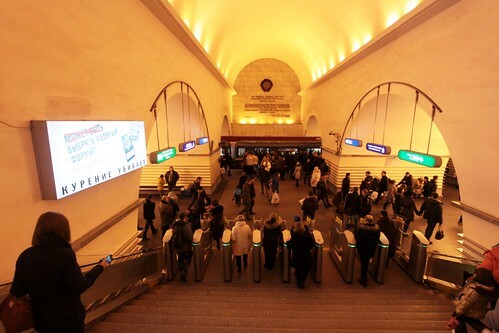 With some busier stations having escalators to move the crowds. 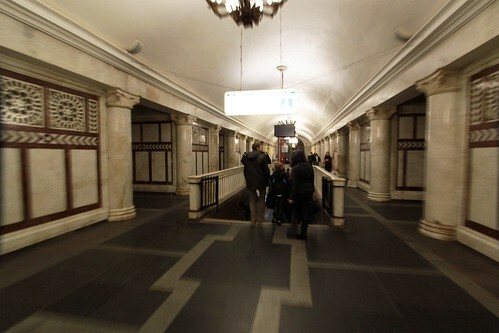 But no matter which way the stairs go, there are always transfer corridors. They often curve along the way. Along with changes in grade. But keep going and going. Until they eventually emerge at a railway station with a different name. 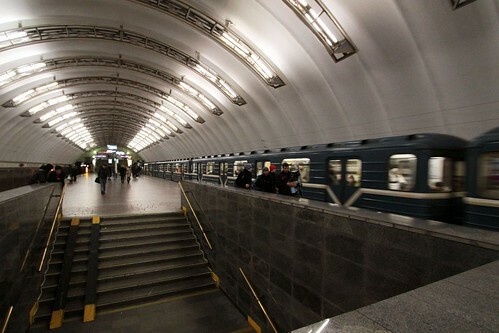 Cross-platform interchanges are a much more passenger friendly way of facilitating these movements, but are rare in Russia – Tekhnologichesky Institut on the Saint Petersburg Metro was the first in 1963. Kitay-gorod, between Tagansko-Krasnopresnenskaya and Kaluzhsko-Rizhskaya lines. 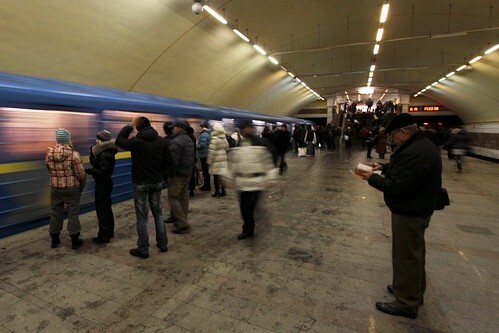 Tretyakovskaya, between Kaluzhsko-Rizhskaya and Kalininsko-Solntsevskaya lines. 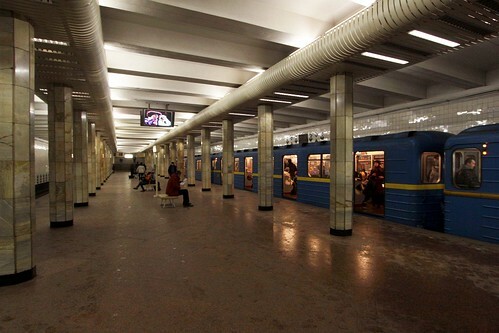 Kuntsevskaya, between westbound Arbatsko-Pokrovskaya line platform and termination platform of Filyovskaya line. 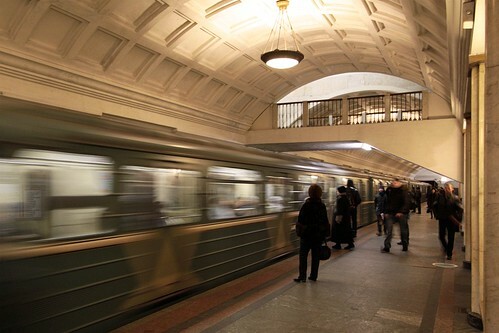 Kashirskaya, between Zamoskvoretskaya and Kakhovskaya lines. Petrovsko-Razumovskaya, between Serpukhovsko-Timiryazevskaya and Lyublinsko-Dmitrovskaya lines. 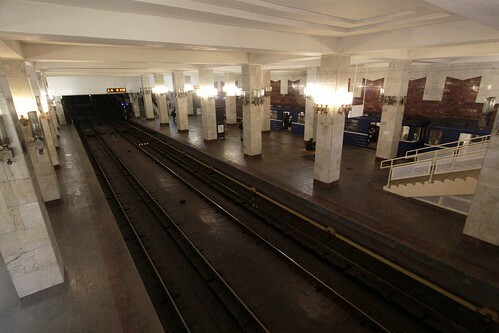 While the Nizhny Novgorod Metro has a unique arrangement – two island platforms located a single cavern, allowing passengers to change between lines 1 and 2, with a footbridge in the middle also allows for them to change direction. 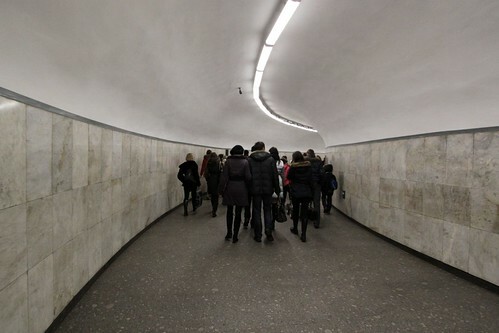 This entry was posted in Trains and tagged Kiev, Kiev Metro, metros, Moscow, Moscow Metro, Russia, Saint Petersburg, Saint Petersburg Metro, Ukraine. Bookmark the permalink.